How many times have you gotten stuck in the tunnel with nothing to do but stare at your shoes? One Muni driver took the opportunity to chat up her riders with some life advice, and one of her riders actually took some notes to share with the rest of us. Remember that it’s ok to step off the train to let other people off. It’s ok; it’s a nice thing to do, and I will not leave you behind, I promise. Enjoy your day. Enjoy the beautiful sunshine. It’s a little chilly out there, and people are getting sick, so remember to cover your mouth when you cough and sneeze, use hand sanitizer, wash your hands often. Remember that there are other people around you. It’s ok to treat them well. Love yourself, and love each other. 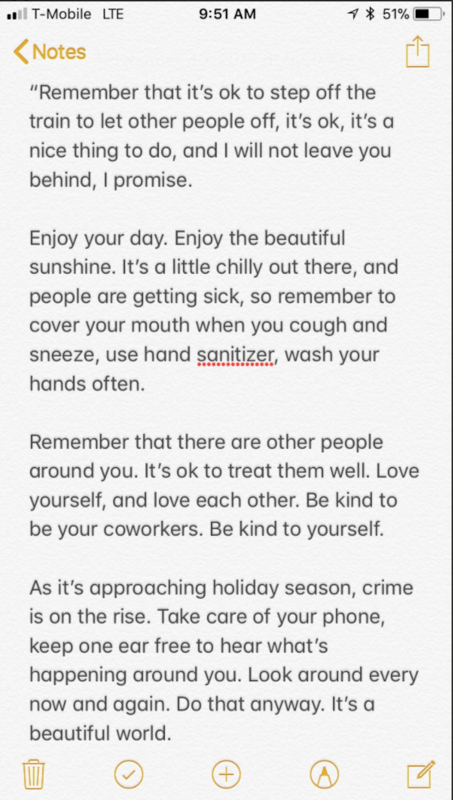 Be kind to your coworkers. Be kind to yourself. As it’s approaching holiday season, crime is on the rise. Take care of your phone, keep one ear free to hear what’s happening around you. Look around every now and again. Do that anyway. It’s a beautiful world. How sweet is this? And how I too will say random nice things to people all day. Thanks, Anna, for taking notes for us! We’ve seen drivers bring a bright spot to our day, whether they’re handing out unexpected treats, playing Jedi mind tricks with you, or serenading you on a bad day. Got another driver story for us? We’re looking for your personal stories about what it means to live here, and what makes our city “so San Francisco.” Tag us on Facebook, Instagram, or Twitter. Our email inbox is always open. As a retired MUNI operator, I’d like to say, well done, to the operator and to the rider. Nothing makes an operators day like appreciation from a customer. I looove this driver!! I rode her train just this morning. She’s a pretty regular driver on my route (K/L/M), and every time she makes my day.